Clip tail and, using tapestry needle, thread through final 7 stitches. Pull tight, thread to inside of hat, and knot. Tuck in ends. If desired, make pompom and affix to hat. Put on and twirl happily. Thanks for this wonderful pattern and well written directions! Can this be knitted on straight needles not circular. 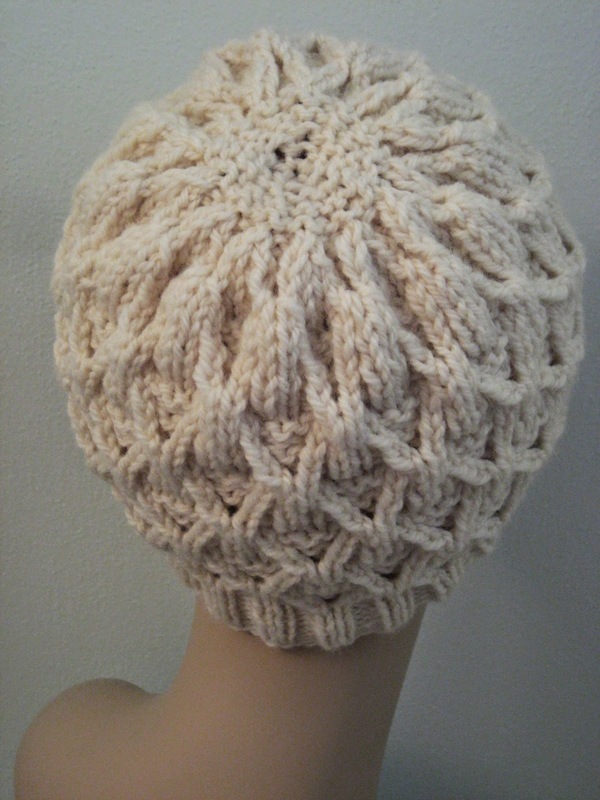 I use straight needles and three days to finish this pretty hat. thanks for the sharing. Have you tried making this for a toddler or child? If so, how would you change the pattern? if it's a 16 pattern repeat you can simply cut out by 16 or 8 stitches to reduce the size. Are you using size 5 us or mm needles? If I need more stitches, in what increments can I add them for this pattern? Was the commenter above correct with 8 or 16? Hi Sarah! You can add increments of 8 in this pattern :) Let me know if you have any other questions! Perfect! Thanks so much for your speedy reply! Super design for a hat. I generally find that a ribbing pattern works best for my preference if it's 4", for a turnback option. I have many balls of yarn needing some creative project. I hope this works on circulars, in the round and not having to use DPs-I can't get the hang of them. I'm sure a rolled up brim would look great on this! And I've never tried it, but some people swear by the Magic Loop method if they don't like double pointed needles. Have you used this before? If you will get bamboo DPN's you'll find that your luck with them will change. They cling to the yarn better than metal or plastic. Your needles won't be sliding out and falling on the floor leaving you with those little stitches just waiting to unravel. I'm not crazy about knitting on DPNs either, especially when there is a yarnover at the beginning and/or end of a DPN. My solution is to switch to 8-9" circular needles until I absolutely have to go to DPNs and then use point protectors on the "non-working" end of each DPN (basically I turn all of them in to very short straight needles.) When I come to a point protector on the next round, I just move it to the opposite end of the same needle and start knitting the stitches from that needle. FYI: The best point protectors I've found so far are from Knit Picks. They seem to be the least likely to come off accidentally. This hat looks great. 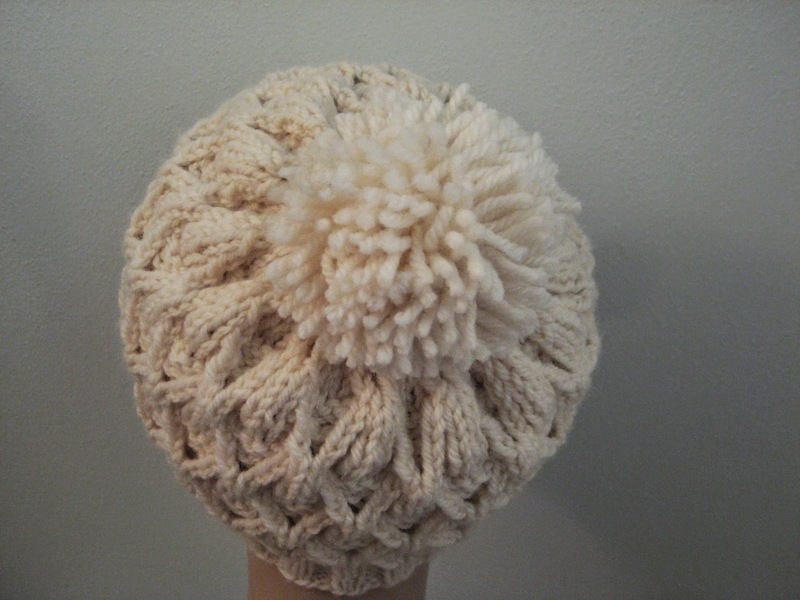 What is the best way to make the pom pom? I would like to make a scarf to match the hat. Do you have a pattern that would work with it? Hello again! I do not have a scarf pattern to match; however, if you want the same pattern and everything, you could simply knit one as follows (this will have a 2 stitch garter edge and some ribbing at the ends, but will otherwise match patterns). I am assuming the same gauge. Knit rows 1 - 12 until desired length is reached and you've just finished row 12 of the pattern. Switch to your size 6 needles. Then knit Ribbing Rows 1 & 2 twice and bind off loosely in pattern. Block, if desired. thank you for this scarf pattern,i have made the hat and love it....glad i saw and read the comments. Thank you so much. I do have one more question though on how many balls of yarn I would need for the scarf. Thank you so much for all of your help. I really appreciate it. Love this!! Made it with Cozy wool, size 8 and 10 needles with 56 stitches, came out awesome. Warm and soft and fits everyone since it has lots of stretch, thank you so much for this beautiful pattern!! Well hello there! It sounds like you have everything set up correctly from the previous row, so all you need to do is remove your row marker (I'm assuming you have one? ), slip one stitch to your RH needle, and replace your marker. Then you should be set up to continue purling your purl stitches while knitting together the k2tog & ssk from the previous round. Basically all this does is move your hat seam over one stitch. Does that help? Oh, and I'm always happy to answer questions. Then maybe the newbies won't make as many mistakes as I did, starting out!!! It happens to the best of us :) And thanks - yes, all boys, all cute, all noise, all the time. It's going to be a long winter!!!! Thank you! I'm delighted to hear it :) And if you're ever making any of my patterns and have questions, please let me know. I'm always happy to help! Hi Gretchen! I am just starting row 1 of decreasing. Can you explain to me what ssk means? I have come to a standstill! Thanks! I totally love this pattern. I just started knitting a couple of months ago and I made one of these hats for my dad and one for his girlfried for christmas. They absolutely loved it. I had to use a different yarn because I live in Germany, but they still turned out nicely. Same for the Fan Lace Hat I made for a friend of mine. Your page is a great help and the instructions are very clear, even for a beginner like me. Yay! I'm so happy to hear that!!! :) I hope you continue to enjoy my patterns. And, as always, just let me know if you ever have any questions. I'm always happy to help! Oh aren't you fantastic with such a quick reply! Thank you so very much! I just got back into knitting after about forty years away. I just finished making this hat for my adult daughter. We both love it, and it was so much fun to knit! Thank you! This is a great pattern! Thank you very much. Gorgeous pattern, can't wait to get started with baby alpaca yarn! My daughter is very picky about having her hats fit snugly on the crown of her head. Previous hats that fit her perfectly measure 8.5" from brim to center crown. Might you have the finished measurements for this hat? Thanks so much for the pattern! 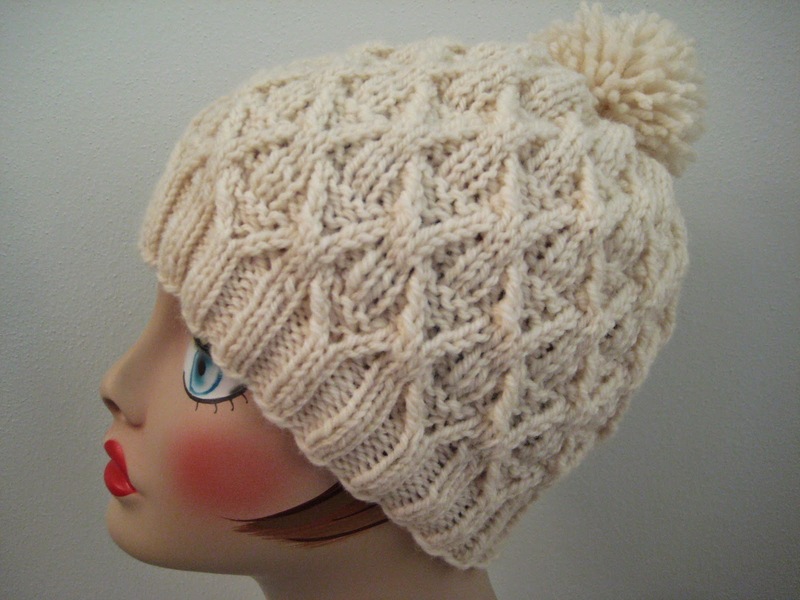 As long as your gauge looks good, this hat should knit up to 8.5" almost exactly. :) Let me know if you have any more questions! Thanks for your response! Just curious: since the piece is knitted using size 8 needles, is it correct that the gauge is indicated using size 7 needles? Thanks again. I'm glad to hear it! And if you've got the same yarn, then I definitely think it should work out well for you. I'll keep my fingers crossed! Row 9: no matter how focused I am to do correctly it keeps coming up one short at the end. Hmm... I'm wondering if you lost a stitch somewhere. Since this pattern is repeated every eight stitches, I recommend looking back over each set of eight stitches to see if one of them only has seven. Your k2 in the middle should also line up with the previous row's k2; looking for issues with alignment may help you find the problem. Good luck!!! When it says the complete rows 1-12 three times. Does that mean three times after doing it the first time, so four times? Or, two more times after doing it the first time, three total? Hello. I am a beginner knitter and learned to knit with straight needles. Is there any way to do this using straight needles? I really love this pattern and wanted to make a hat for my hubby. Thank you. The baby is starting to feel better, so I've had a chance to do this for you. As always when I convert patterns, though, I haven't knit it, so it's possible that I've made a mistake. If things stop looking like they should, please let me know! Transfer final 9 stitches to scrap of yarn for holding. Seam from bottom of hat – you should have a full stitch on either side that should get sucked into the seam. When you reach top of hat, thread seaming yarn through final 9 stitches and pull tight. Thread to inside of hat and knot. Tuck in ends. If desired, make pompom and affix to hat. Put on and twirl happily. I am an advanced beginner knitter too, and I would strongly encourage you to be brave and take the plunge into knitting in the round! It's really easy once you get started, and will open up new worlds for you insofar as knitting hats, socks, etc. There is a book available in your local public library called "Circular Knitting Workshop: Essential Techniques for Knitting in the Round" that will get you off to an excellent start. Treat you to a few sets of circular and double-pointed needles, and off you go! You'll be amazed at the results. You can do this! For the right twist: After knitting the two stitches together, to I transfer them back onto the left needle to re-knit the first? Then transfer that stitch back onto the left needle to slip both stitches onto the right needle? For the left twist: Same question. Do I slip the first stitch, knit the second, transfer both back to the left needle to knit them together? Hi there! 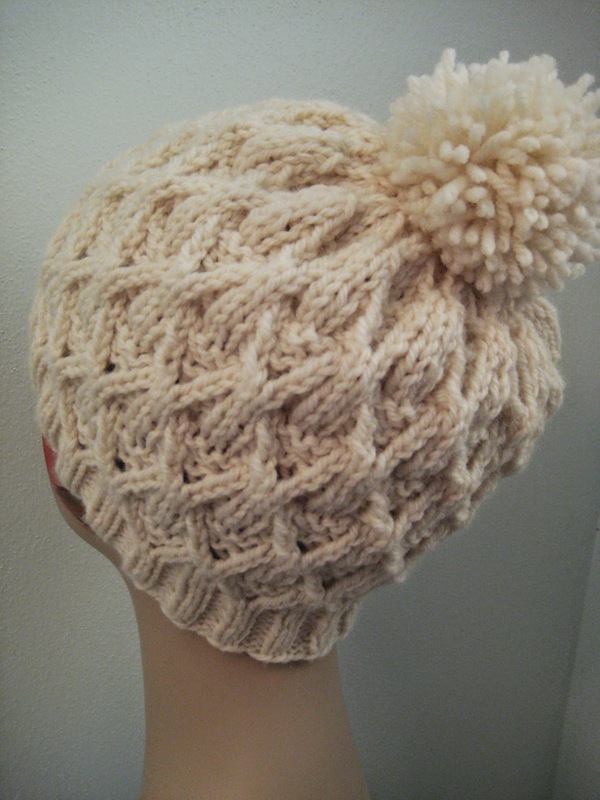 I have just finished this gorgeous hat, and I would like to post a link of this pattern on my (brand new) blog. Really enjoyed this pattern, it was so much fun to make and it turned out so wonderful! You are more than welcome to post a link to this pattern on your blog! :) Can't wait to see the hat. Thank you very much indeed! I'll send you a link when I am through! This is my blog entry! I love this hat! Thanks for sharing this pattern. Hello Gretchen. I absolutely love this pattern and plan to make several as Christmas gifts. Just a note to those who had trouble with the rt and lt stitches. The rt is c2b (one stitch on cable needle held to back, knit next stitch, knit stitch on cable needle) and the lt is c2f (one stitch on cable needle held to front, knit next stitch, then knit stitch on cable needle). Glad you like the pattern. :) And yes, you're right - the twists are basically just eensy weensy cables. So cute! Здравствуйте, опять к вам с просьбой, может есть схема этой шапки. Hi again! I got another strange translation. :) Are you asking for a chart? Привет, да схему, как к той шапочке. I made this hat and love the pattern. Just wanted to share. 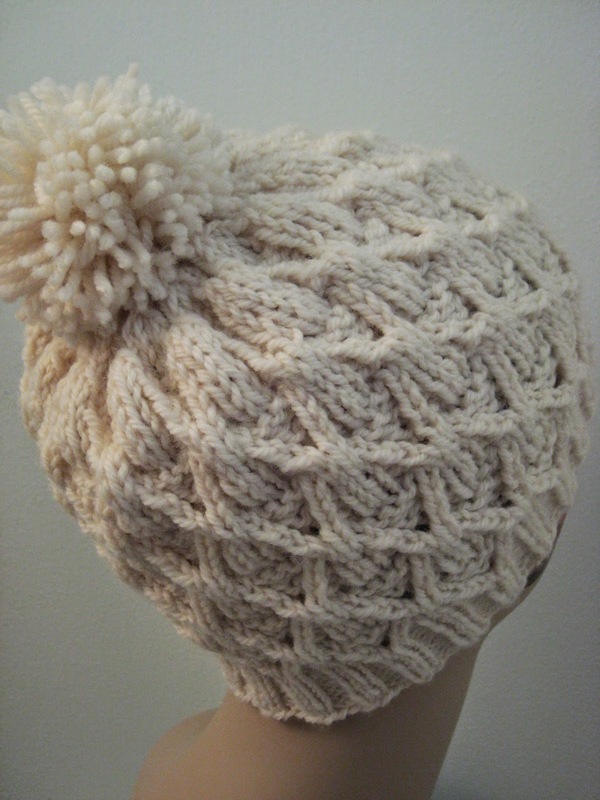 I am not a fan of pompoms so I left it off and then I didn't like the purl stitches on the crown - soI just did knit stitches all the way to the top and it looks great!. I loved making this pattern for a friend's birthday. I had someone ask if I could make and sell them one. So I'm curious if it would be alright with you to sell any hats made with this pattern. I completely understand if you would rather I didn't. Hi, I've knitted a few of ur hats so far and they hav all been a total success! Thanks for ur concise instructions and beautiful patterns. Yay! So glad you like them. :) And please, let me know if you ever have any questions! First off - yes, there are at least two ways to do left twists. I have done two, and still wouldn't be able to tell you a huge difference between the two (although maybe there is one? This is definitely my preferred method). Honestly, I wouldn't worry about it too much. Just finished. I've learned a lot from this project. Thanks for the clear explanation. Wonderful! Hope your hat turned out well. :) And please, let me know if you ever have any questions! Which cast on did you use? Also, I'm using Caron dazzleaire bulky 5 (closer to 4 than 6, is pretty small 5) is that going to work? 80%acrylic, 20%nylon. Gauge is 4x4 is 14s/20r on US10 needles. I'm really new to knitting and confused. Do I need to adjust the pattern? I tried tubular cast on with foundation rows but it turned out stuff and bulky so I ripped it out. Once again returning to your blog for your lovely patterns--you are my favorite designer! However, I'm having a bit of trouble: I've switched from size 5 to size 8 by knitting the first row in the general pattern, and in the second row I'm coming up with one extra stitch on my first round-of-eight repeat. I know this is because I knit the first stitch that stood on its own in the first row (the k1 that begins the row 1 pattern), as the second row instructs, but now that's left me with one too many stitches... was I not supposed to knit that stand-alone stitch? It seems like the only option as row 1 ends p2, k1... I'm not sure I've explained my problem very clearly, so if you need me to clarify please let me know! I'm glad to hear that you are enjoying my designs! :) And as far as your question is concerned, I'm trying to understand your problem but having trouble! As you've obviously gathered by now, the ribbing is staggered by one stitch, but otherwise just a basic * k2, p2 *. And the reason it's staggered is so that it will line up with the actual stitch pattern - which means that the 8-stitch repeating pattern will line up with a k1, p2, k2, p2, k1 from the ribbing. Does that help at all, or am I still missing the trouble? I think I understand... so the staggered stitch is the beginning of the first iteration of the 8-stitch repetition. The reason I'm having trouble is because if it's supposed to be the first stitch, that makes 9 stitches between my first two markers. So I just have to move all of my markers one over? I think the reason I'm confused is because it seemed to make more sense to add the staggered stitch to the end of the round instead of the beginning, as the end of the round has one stitch missing from the regular * k2 p2 *, but then that messed up the pattern... I'll try moving my markers over and see if that's the issue. Thank you so much! That sounds right! As long as you still only have 104 stitches on your needles everything should work out... And, like I said, the reason I wrote the ribbing like that is so it would work out with the pattern better! Of course you can line things up differently (to the k2, p2 instead of staggered one), but it will probably break up the flow a teensy bit. Hello, I love the intricate pattern. 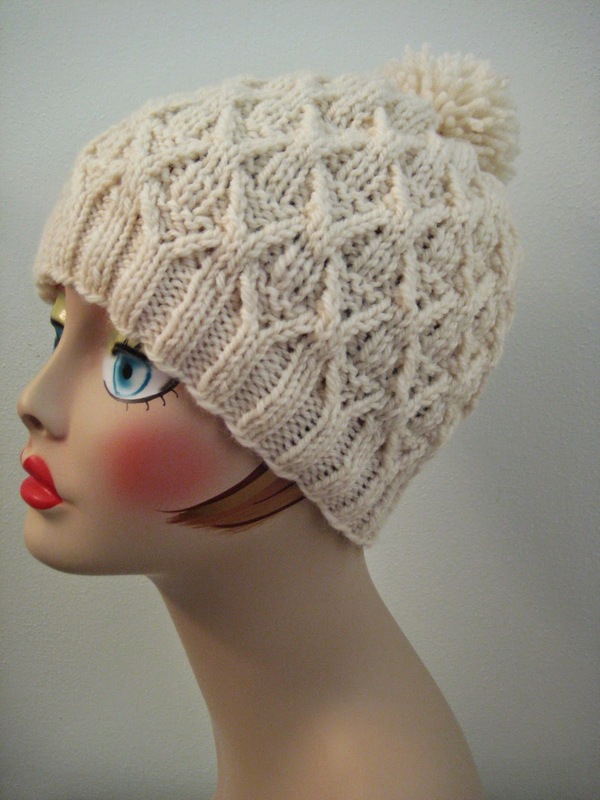 I would love to make this for my daughter in law, but she likes super slouchy hats. Should I go up 2 or 3 needle sizes? I love your patterns and yarn choices!! I typically post the yarn gauge given on the yarn label (unless I run into problems or don't feel that the gauge is accurate for me, in which case I make a note), which is why this pattern is kind of funny with the needles I use and the gauge given. Basically, the label called for 7s but I knit it on 8s. It's not a very finnicky pattern, gauge-wise, though, so if you've got a yarn and you're in the ballpark of the gauge and you've got similar-sized needles you should be good! Hi. I am a self taught left handed knitter. I love this pattern and I have attempted this pattern a few times but I can't seem to get the pattern right. Are any suggestions how to achieve this pattern for lefties? Thank you. Thank you so very much for your response. I didn't think about the chart in reverse!!! :) I will try it and the videos. Happy Holidays!!! Fantastic! Glad I could help!!! Thanks for sharing this pattern for FREE. I am desperate for some quick knits for Christmas. This is perfect. FYI! My name is Gretchen! Well Gretchen *is* the best name... :) And I'm glad you like the pattern! Good luck with your Christmas knitting, and let me know if you have any questions!!! Yeah, I understand! :) And yes, I have considered making a video for this one, I just haven't found the time. I'll try to bump it up the list though!!! Thanks! That would be great! Will you post the link here if you do? Made 2 of the wicker works hat and I love the pretty pattern. Thank you so much. Hello I'm getting ready to make this wonderful hat and have one question. What size does this hat come out to? Thanks! That's sort of a tough question because this stitch pattern is quite stretchy, so (from what I've seen, at least) it fits lots of head sizes well. If the ribbing were done in stockinette it would be about 21" around, but since it's ribbed of course it easily stretches to at least 24". And top to bottom the hat is about 9.5" - 10", I'd say. It sounds like you have an average-sized head, which this hat is designed for. :) However, if you'd like to make it smaller you can cast on 8 less, or a multiple of 8. Let me know if you have any other questions! I have just finished knitting the hat. Ugh and I swear I spelled your name correctly originally... My phone must have autocorrected it. Apologies! I'm glad to hear that you like the pattern, even if you're having difficulties with it! :) Anyway, sometimes I'm able to diagnose problems based on the rows but unfortunately this time that isn't the case. I suggest placing stitch markers after each grouping of 8 stitches (the pattern repeat - and remember you can use yarn scraps tied into loops, paper clips, etc for stitch markers since you're going to need quite a few!). That way when you work row 3 you will immediately see where the extra stitch is coming from! Anyway, let me know if you have any other questions and I hope that helps!!! Hi Gretchen, I love your patterns. I only starting knitting in the round at the end of last year. I made this hat for my mum and I was wondering about a snood. Would that be knitting rows 1-12 about 4 times? I was wondering how many stitches to cast on. Oh, and let me know if you have any other questions!!! Hello there. As a novice to knitting in the round, would it be okay to use dpns throughout instead of circular needles? Also, Im a bit stumped on 'Decrease Row 5: slip first stitch from first dpn and slide to last dpn'. Does this mean slip the first stitch on the left needle to the right needle?? Perfect! :) And let me know if you have any other questions!!!! By the way, the elibelinde pullover from pompom autumn issue is using this stitch all the way! Hello! When doing the right and left twist stitch it adds another stitch. So for the following row do I knit them together as one stitch? Or do I treat them as separate sticthcea? Oh thank you!! I did this pattern last year and had no issue with it and I tried it again this year and I guess I was overthinking it. Thank you so much for responding!